Friday 23rd March – break up for Easter (normal time). Because we were unable to celebrate World Book Day because of the weather, the children have asked if they can come as their favourite book character on Friday 23rd March. We will also be selling books for £2 in the hall after school so come and grab a bargain. Monday 9th April – start back. Thursday 3rd May – INSET so school is closed to pupils. Monday 7th May – May Day so school closed, open as normal on Tuesday 8th May. W/C 14th May – Y6 SATs week. W/C 21st May – Y2 SATs week. Friday 25th May – break up for half term (normal time). Monday 4th June – start back. 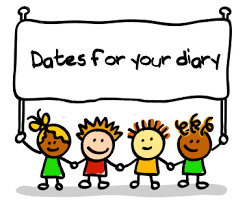 Monday 2nd July – Parents evening to view your child’s work and meet their new class teacher. Thursday 5th July – Y6 leavers play. Friday 6th July – Y6’s last day. Friday 20th July – break up for the summer at 2pm.